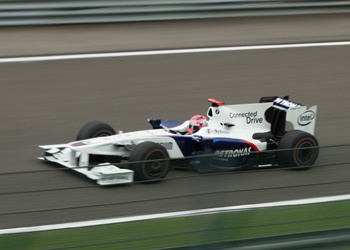 The future of Robert Kubica in Formula One has yet again become uncertain. The Formula One team of Renault, which has signed Kubica to become their driver for the next season, has officially stated it will make its definite decision whether or not to stay in F1 no sooner than December, after having held an emergency meeting when it became known that Toyota had pulled out of Formula One. Ferrari responded negatively and with a great deal of sarcasm on their website, stating that more and more manufacturers and key sponsors pulling out of Formula One holds a similarity with the Ten Little Indians, the detective novel by Agatha Christie. Renault responded with the statement that it will have to re-evaluate their decision to stay within Formula One; a decision that could threaten the position of Robert Kubica. Should Renault decide to leave Formula One, Ferrari would be the only manufacturer left in the elite racing class, assisted by Mercedes Benz and Cosworth as engine suppliers. Last year, Honda pulled out when the Japanese multinational could not afford Formula One activities because of the global economic crisis. BMW followed suit in July. and tyre manufacturer Bridgestone has also announced that it will quit Formula One by the end of 2010. Pirelli has announced that it is not interested in reviving its Formula One activities. Other racing classes, such as the A1GP, have already cancelled most of their races and are near bankruptcy. Ferrari stated that these events should be interpreted as bureaucratic behaviour by the FIA (International Federation of Motorsports) and are threatening to motorsports as a whole. Formula 1 continues to lose major players; in the past twelve months, Honda, BMW, Bridgestone and, only this morning, Toyota, have announced they are leaving the sport. In exchange, so to speak, we will now have, Manor, Lotus (at least in name only, as this incarnation has little to do with the team that gave us Colin Chapman, Jim Clark and Ayrton Senna to name but a few), USF1 and Campos Meta. Can we claim that it is a case of like for like, just because the numbers sitting around the table are the same? Hardly, and we must also wait and see just how many of them will really be there on the grid for the first race of next season in Bahrain and how many will still be there at the end of 2010. The reality is that this gradual defection from the F1 fold has more to do with a war waged against the major car manufacturers by those who managed Formula 1 over the past few years, than the result of any economic crisis. The remains of BMW Sauber have been bought by the Swiss-based company Qadbak Investments Limited and with Toyota out, the team is likely to stay within Formula One, especially since petrol supplier Petronas have decided to stay as sponsor and Ferrari have announced it will serve as engine supplier. And at the moment, that’s where Kubica’s most likely back-up plan will be. Other new teams have made steady progress, such as the new Lotus team. They are rumoured to have contracted Toyota drivers Jarno Trulli and Kobui Kobayashi. Campos Meta, another new team, have confirmed that the cousin of the late Formula One legend Ayrton Senna, Bruno Senna, will take one of the racing seats. He will, most likely, be coupled with the experienced Spaniard Pedro de la Rosa. More and more sources indicate a move by Kimi Räikkönen towards McLaren, while Heikki Kovalainen, ditched by current employer McLaren, has been said to be joining Force India, as both driver and team can combine their gained 2009 experience with the Mercedes Benz engine. Williams already confirmed their 2010 line-up: driven by Cosworth engines, the privateer team will have German GP2 champion Nico Hülkenberg and F1’s most experienced driver of all time, Brazilian Rubens Barrichello, in their cars. Barrichello finished third in the 2009 championship as teammate to the new world champion Jenson Button, who still is in negotiations with his team Brawn GP about a new contract.